Aiken House & Gardens: I'm in the Garden ! I'm in the Garden ! Spring has finally arrived here so you may have noticed I have been a little bit absent lately- well I am in the garden,finally! My rubber garden boots were a yard sale find last fall for $1. but my husband thought they should have paid me to take them! Ha Ha! I am so happy to have Andrew working with me in the garden since he is now semi-retired and works from home. 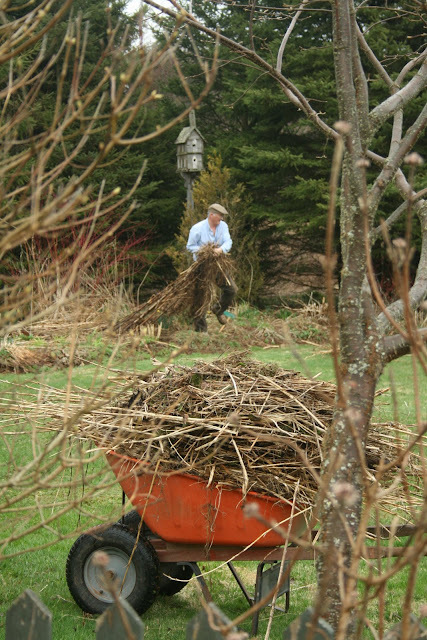 There has been many,many big wheelbarrow loads raked of the beds even though many of them where cleaned up last fall. Gardening is definitely a labor of love!!! Although there is not a lot of color in the garden yet- everyday now there will be more and more. We have thousands of daffodils ready to burst into bloom. 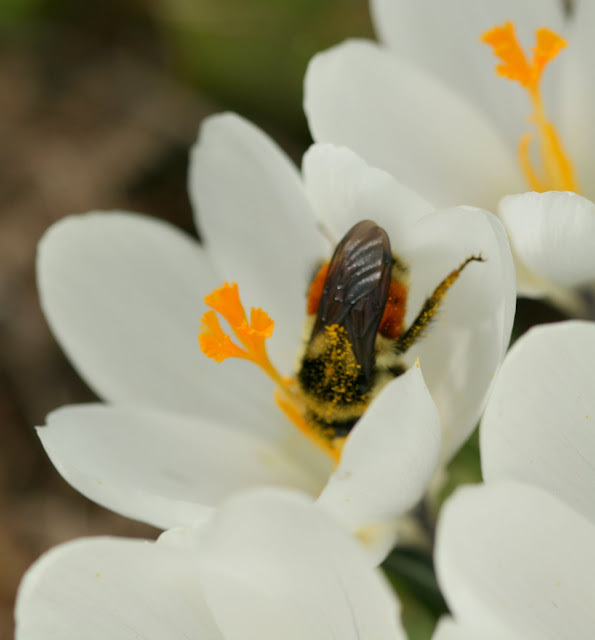 I am happy to have the bees buzzing around the blooms. 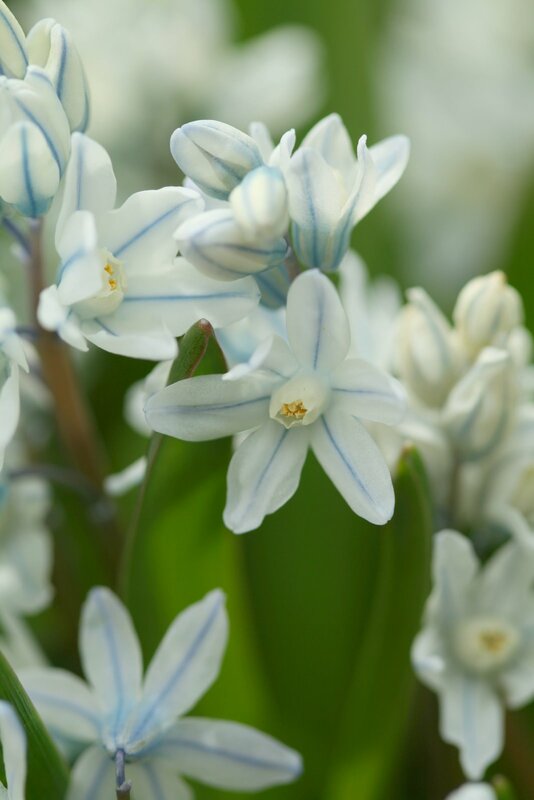 Puschinia scillaides or striped scilla. Tiny bouquets for my kitchen windowsill. My husband and son had to build a new roof for our terrace as the old one collapsed under the weight of the snow that we had this winter. I can't wait for to enjoy our meals out there again soon. 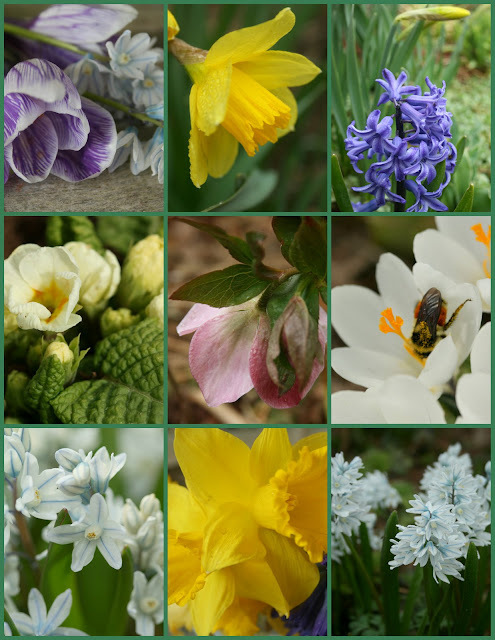 A collage of some of our early spring blooms. Well, I hope you will be patient with me for awhile as I post a little less for a week or so but there is a lot of spring chores to do in our 2 1/2 acre garden. Ah! but soon there will be lots of beauty to share with you. 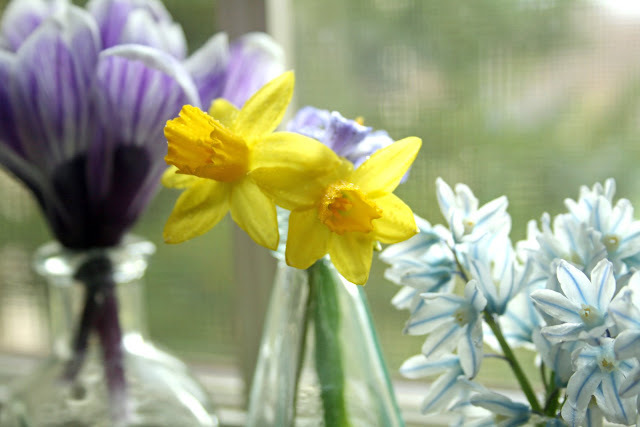 I hope you are enjoying your spring too! I am joining My Romantic Home for Show and Tell Friday today. Hi Carolyn! I have missed you! Now I understand your absence - your garden! Now I love those cute garden boots of yours and such pretty blooms your giving us today! Have fun. Dear Carolyn, you must have had loads of snow for your roof to collapse, how sad and how good your husband and son make it again, it looks lovely already!!! Wish you have bought more pairs of those wonderful boots!!! Your garden is large and very beautiful, it should give a lot of work to leave it like flowers. Enjoy your time in the Garden ..it was long time in coming! I can't wait to see your garden in full bloom again this year..take care. P.S. I love your boots! Carolyn - I have some of those boots too. They are great. I am bo-legged so mine go out when I wear them - ha! Your garden will bring all of us joy! I know the feeling of being able to get back out in the garden. Our Spring arrives much earlier and I have been enjoying the garden for a while now. I just posted on my blog about a garden dinner party that I had last night. Everyone loved it and I was so happy to share my garden and hard work. Yes, it is a labor of love. Did you enjoy your visit to FL? I so enjoyed this post seeing the gardens....and so nice for you to have help. Gardens can turn back to the wild and really need the tending. Oh I love your boots! They are so cute and perfect for working in the garden. You have so many pretty things blooming now...it must be beautiful. Just think all of this loveliness was hiding under the snow! Carolyn, love love those garden boots... I'd wear them with a flowing skirt! ;) And to see you out in your lovely garden.... pure joy! i certainly understand about blogging less and gardening more!! those boots are adorable...i need to find a cute pair since we have been getting so much rain lately. happy spring to you, my dear. I know you are so glad the snow is finally gone. Anxious to see your garden evolve over the season! LOL! I KNEW that you were out there with your hands sunk in to that luscious dirt, Carolyn! :) We can finally do that! Yay! Did I read correctly that you have THOUSANDS of daffodils??? Wowzer! That definitely is a labor of love, girlfriend! ♥ Have fun out there! Tis the season to scrub dirt from the fingernails! You are certainly styling in those boots and your husband's sense of humor is so much like my hubby's. He keeps me smiling and is such a wonderful help to me. Looking forward to seeing the fruit of your labor. Very beautiful. What pretty striped skilla. All the flowers are so pretty and the images make it seem as though I'm there. Enjoy your time in the garden and your new boots. It all brings such soothing to the soul. Ahhhh, Carolyn. Welcome back. Thanks for all your lovely posts ou left for us while you were away. Sounds like you had a super vacation. Now, in the future, we'll all look forward to "ESPANA!" Wow, you already have some beautiful flowers! My tulips and daffodils (the ones the squirrels didn't eat) are coming up and I"m excited about those. No blossoms yet, though. 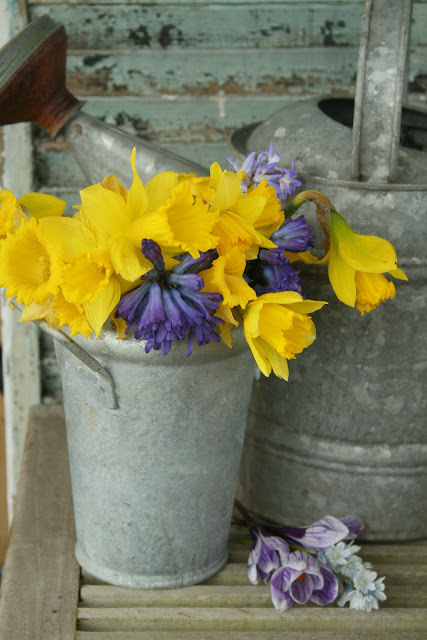 This spring has been a difficult one here and I am itching to be in the garden too - when it stops raining! Nothing like spring after a long, difficult winter. Enjoy! Your words 'I am in the garden' put a smile on my face. I know how much you love to be working in your garden again. How much fun it is that you can do it together!! Your boots looks great. Andrew's remark about your boots reminds me a bit of remarks my husband makes too. Especially when I found something at the fleamarket or in the thrift shop :-)! I love gardening and do it in a garden like yours it would be amazing! Your boots are adorable, I want the same!! You'll soon be enjoying your beautiful garden and a pleasant evening sun! Good weekend! It must heaven for you to be in the garden, breathing the fresh air, smelling the spring flowers, working and watching and imagining the garden in summer. I wish you a beautiful weekend of May 1st. In France, the custom is to offer lily of the valley as a lucky charm. 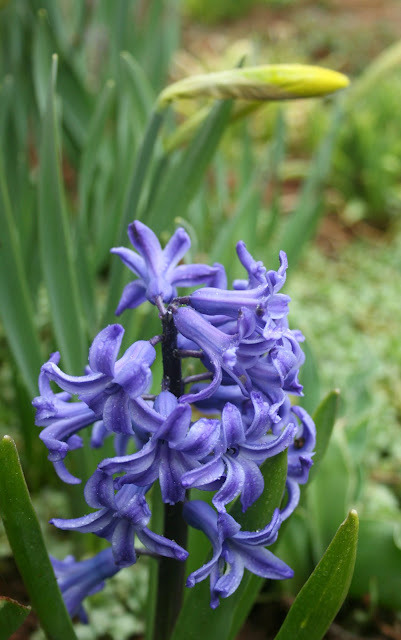 Looking forward to watching your garden unfold! I bet you are in your garden. It looks absolutely wonderful. The boots are perfect! Don't listen to your husband! It must be so nice to work in the garden after a long winter. The boots are really cute. 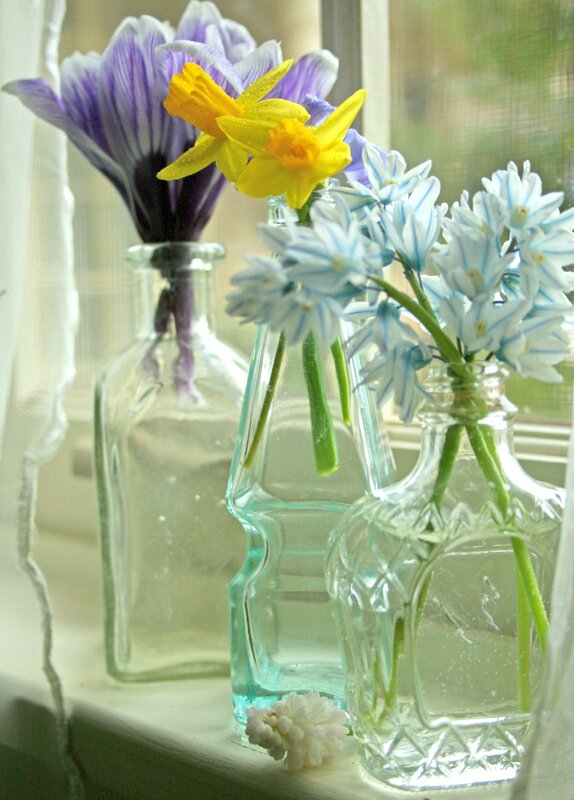 Also the first spring flowers from your garden are so pretty, I love how you displayed them in small bottles. 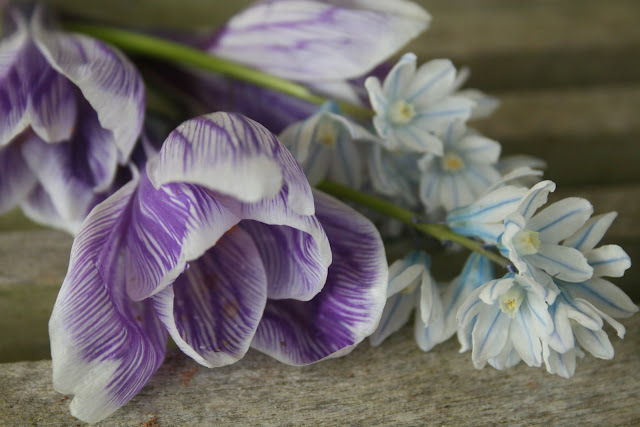 I am in love with your Striped Scilla. That is so lovely. I agree that gardening is a labor of love and it's so nice that Andrew has time to help. La primavera che si risveglia mi commuove ! 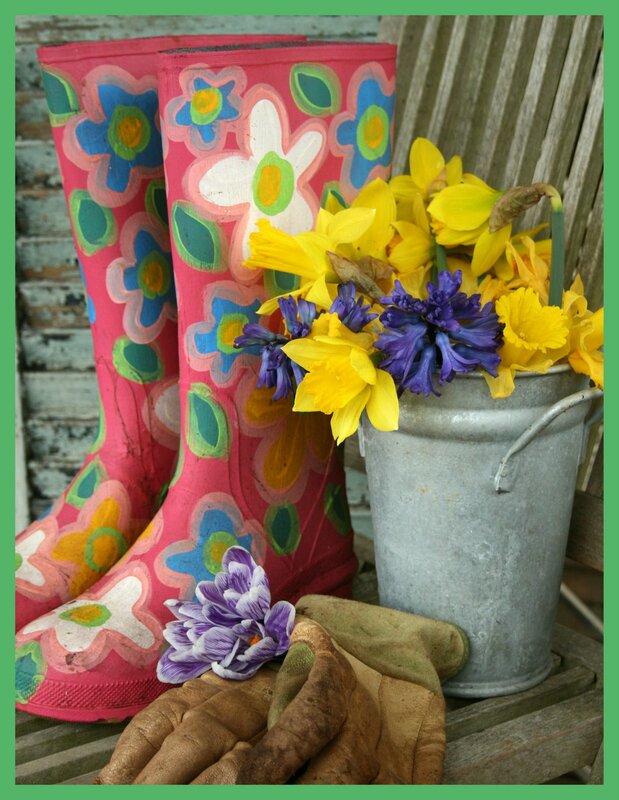 I love those boots, I have a pair of bright pink garden boots ,That are fun to work in.